Herb has contributed to many historic publications on and off line. His knowledge and expertise has even extended beyond our borders. Here shared one of his prized treasures to Jo Edkins of the United Kingdom for his, “Historical documents featuring Imperial units” section for Mr. Edkins web site on Imperial Weights and Measures. 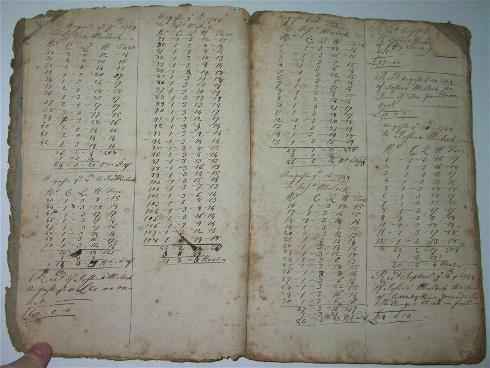 "Flour mill day account book This is a page from a 1747 flour mill day account book for a Philadelphia Quaker miller named Thomas Livezey (1723-1790). The columns are headed C (hundredweight), Q (quarter) and # (pound). The last column is Tare. This is the weight of a container, which subtracted from the gross weight gives the net weight. There are also some references to money, as pounds, shillings and pence. The hundredweight is the long hundredweight of 112 pounds. This can be worked out because the way that the total is reduced to the correct units. Also the tare is in pounds. This is totalled in the first account as 208, which is reduced to 1 Cwt 3 Qtrs 12 lbs, and subtracted from the previous total (which must be the gross weight) to give the net weight. I originally read the pound column as lb, which is the British abbreviation, but I am assured that the correct abbreviation would be # at this time. With thanks to Herb Lapp who is researching this miller and his accounts." The four leaf clover seen here was one of many put into this famous book by one of Livezey’s two grandsons who lived at Glen Fern after their grandfather had died in 1790. These became important to me since they further illustrate another aspect of this treatise’s use through its history. At that time this book was just a special book not a $200,000 rare book that it is today! This series on Philadelphia merchant flour miller, Thomas Livezey (1723-1790), so far has comprehensively detailed his life covering such topics as his early education, Quaker faith, the site for his mill, seminal development of central-eastern Pennsylvania‟s transportation infrastructure for raw materials and goods that influenced his civic and political activities. His relationship with Benjamin Franklin and many other influential Pennsylvania political, religious and business leaders joined him among the ranks of those notables. His Quaker beliefs and personal philosophy dominated his personal vision that he was a North American British citizen that restrained him from taking a supportive role in the American Revolution. Even though this prevented him membership among the nation‟s founding fathers, his accomplishments in these critical arenas profoundly contributed to building the foundation for our nation lead me to see Livezey as a second tier founder.